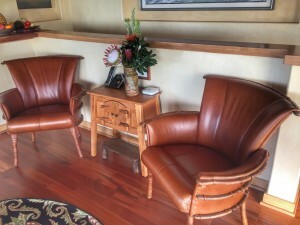 When clients who frequently entertain asked me to help them find a unique dining room table that could comfortably seat 10 to replace their old ho-hum table that only sat 6, we went through the motions of looking at a variety of different tables from diverse manufacturers. “Too traditional,” she would say when I showed her a picture of one that would seat 10. “It’s nothing special,” he would offer when I showed him another option that would seat 8. 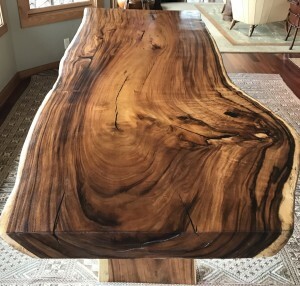 And then I had an idea: maybe they would like a raw-edge slab wood table, something truly organic, yet sophisticated and unlike any other table. A couple of days later I dragged them to a local store that imports from Indonesia. 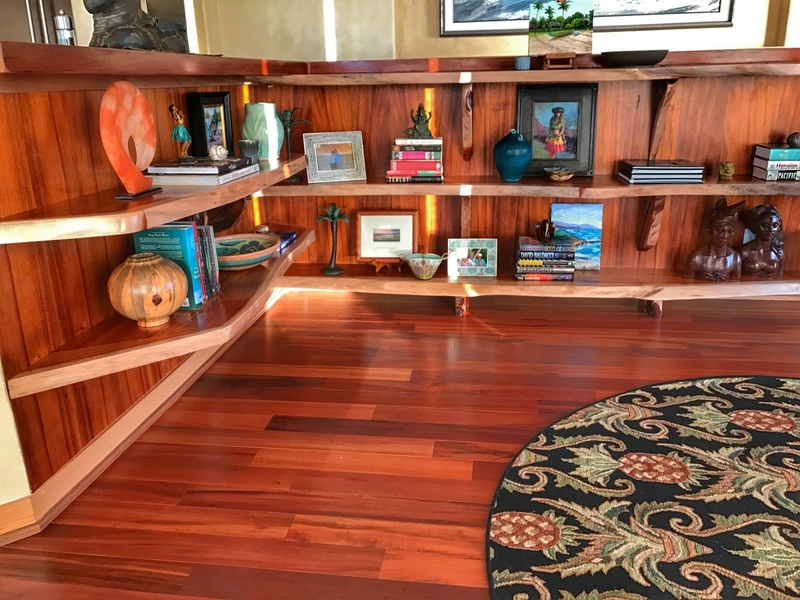 They have countless slabs lined up by wood: monkeypod, koa, mango. Though they always have a nice variety, we settled on one that had particular character. “That’s the one!” the wife said with excitement. Weighing several hundred pounds, it took 8 men to bring the 4″ thick, 10′ long slab of monkeypod into the house. 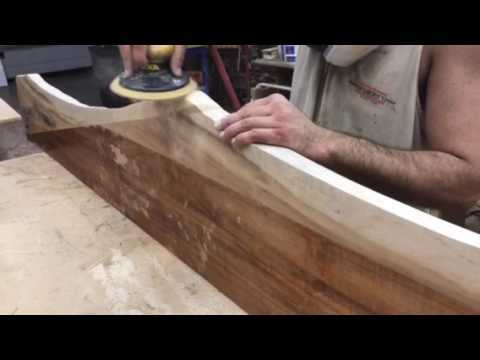 The table is not only practical (it can seat up to 12 if everyone sits closely! 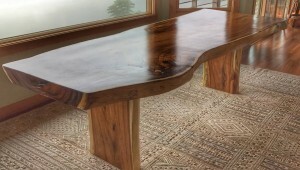 ), but it truly is ‘art’ as the wood grain is deep and resonates with richness. 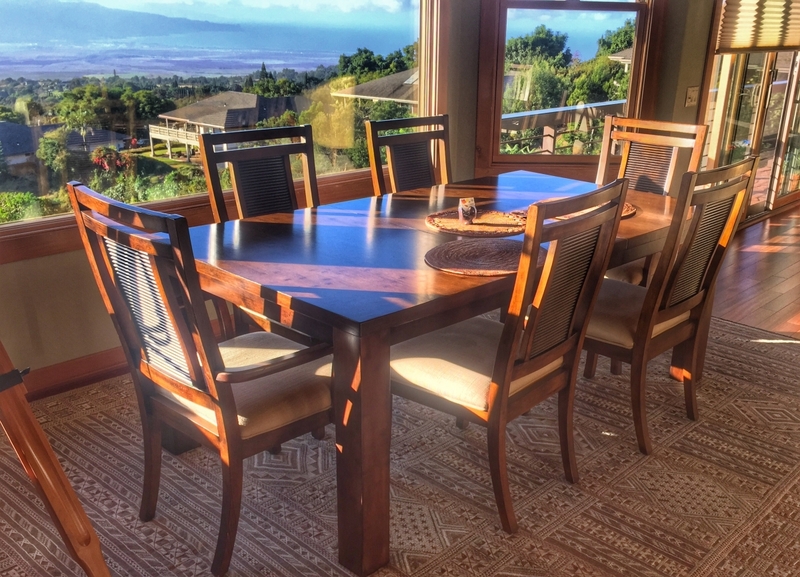 Their home is at 3500′ in Kula on Maui, and the dining room is sited directly in front of commanding windows with views that stretch from the island of Moloka’i to the West Maui Mountains all the way to Lana’i. It is spectacular, to say the least, and their new table is well placed to offer all lucky guests some of the best views in the world. The first picture is the table they had before, while the two pictures after show off their new ‘organic art’. 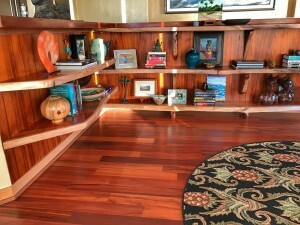 As often happens in design, one challenge solved begets another: they had always wanted to create a library in their entry but didn’t know how. 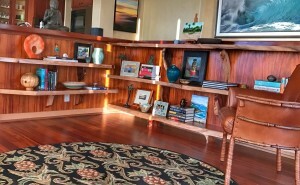 The entry is a peculiar space with low 40″ high walls, and they weren’t sure where to buy shelves that would fit properly. 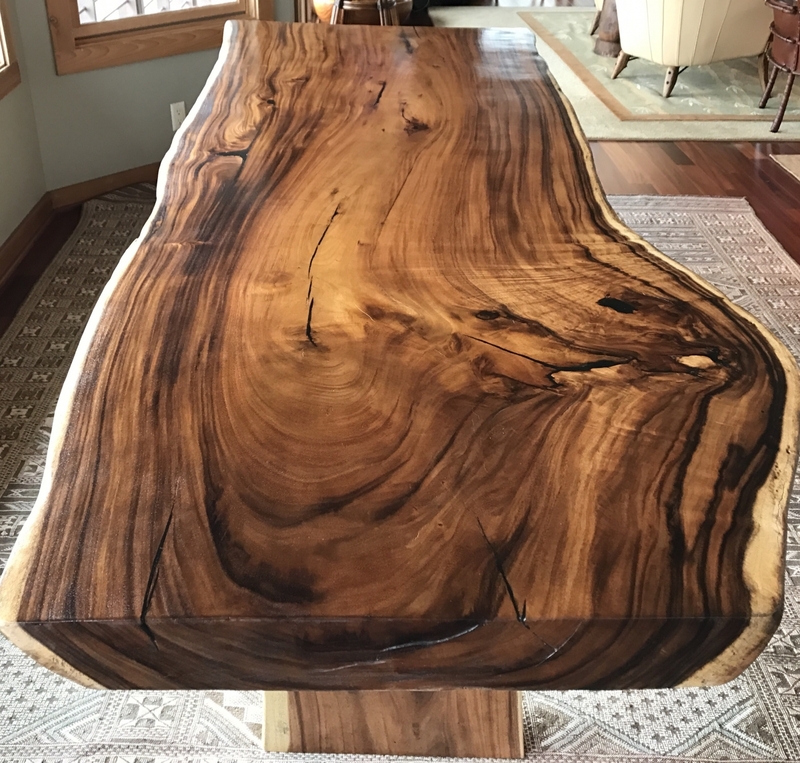 When the raw-edge dining room slab table was in place, I realized that we needed to mimic that same look – and I knew exactly who could do it. Radd (his real name!) is one of the more artistic carpenters on Maui. 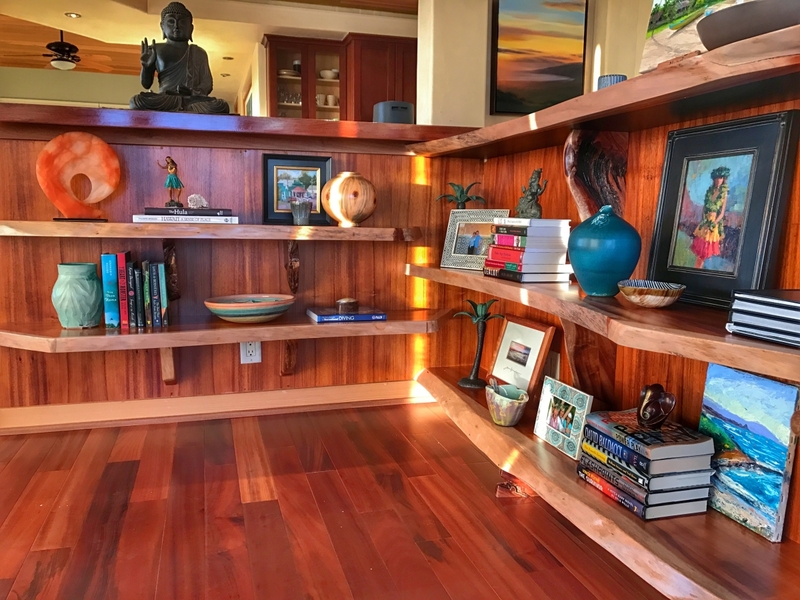 Once complete and hung cantilever style, the koa shelves add an incredibly warm tone to the home’s entry. 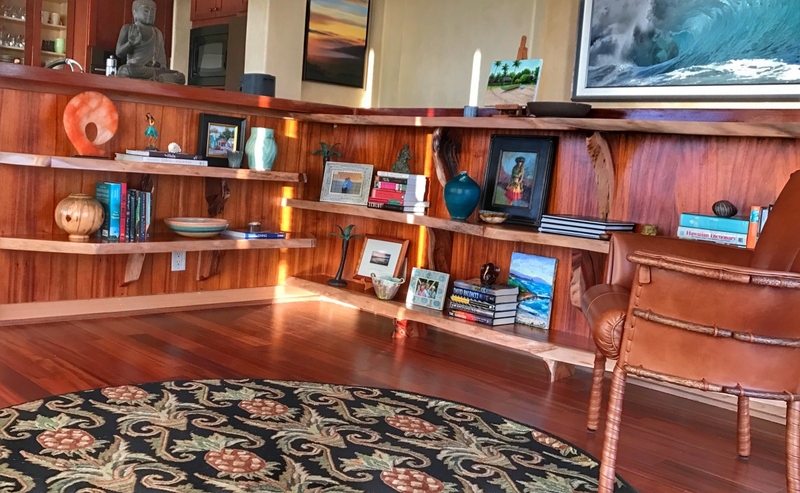 What started as a desire for a larger table, transformed into creating dimension and richness into this already gorgeous home.